This week on Geek & Sundry’s TableTop (the insanely popular board game web show), host Wil Wheaton welcomes Jerry Holkins and Mike Krahulik (“Tycho” and “Gabe” from the Penny Arcade webcomic); and actress and voice actor extraordinaire, Tara Strong (featured in dozens of animated movies, TV series and video games). Together they’ll defend the realm; take on the forces of evil; search for the Holy Grail; and undertake many other death-defying quests as they play (the insanely popular cooperative board game) Shadows over Camelot. But they must stay vigilant… one of them may be a traitor working secretly to foil the plans of the others. Find out whether the loyal Knights are able to emerge triumphant. 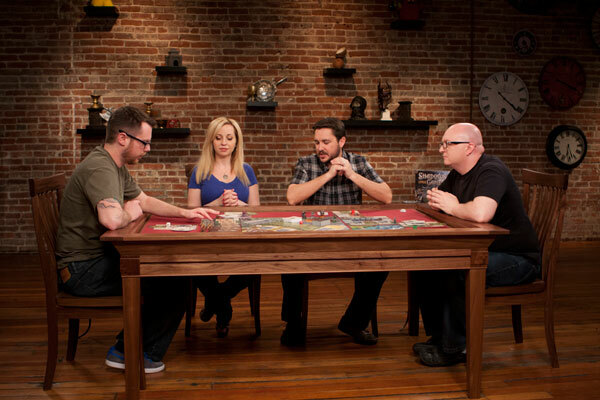 Watch the Shadows over Camelot episode on Geek & Sundry’s TableTop. To learn more about the board game, visit the Shadows over Camelot web page. This entry was posted on Thursday, October 3rd, 2013 at 18:36 and is filed under Events, Games, News, Shadows over Camelot. You can follow any responses to this entry through the RSS 2.0 feed. Both comments and pings are currently closed. Chill Allan. Issue is a dead horse. Move on.